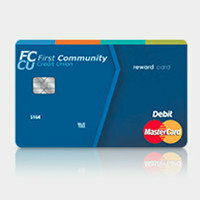 First Community Credit Union is pleased to announce that debit cardholders will receive new EMV chip cards. This card replaces existing debit cards and contains an embedded chip that uses secure technology to make it harder to copy your account information, better protecting you from fraud. Take a moment to review the items below, which outline some action that may be needed on your part. Debit Card Reissue: At the beginning of October, cardholders will receive your new debit card in the mail. Please activate and begin using your new card immediately. Your current card will no longer be valid after October 19th so it is extremely important you start using your new chip card as soon as you receive it! Card Number Change: Your 16-digit debit card number will change so you will not maintain the same card number you had prior. IMPORTANT – Set New PIN Number: If you use your debit card at an ATM machine or as a "Debit" transaction at a merchant terminal instead of a "Credit" transaction, you MUST SET a PIN number when you activate your new card. Your old PIN number will not carry forward. You can set the PIN number the same as you had it on your old non-chip card, however, you do need to set a PIN when activating your new chip card or you will get declined when performing a PIN-based transaction. Automatic Payments: Since your card number is changing, it is important you update your debit card information with any company you may have established an automatic payment with. Once your new card arrives you will need to contact the company to update the card number and expiration date they have on file. If the company can process your payment via ACH, you may want to consider setting up the automatic payment using that method instead of using your debit card number, which would eliminate the need to update your information each time your card number and/or expiration date changes. To learn more about EMV Chip Technology and how it differs from the magnetic stripe, click here. Ensuring we provide you with the most secure method of payment is extremely important to us. If you have any questions throughout this process, please don't hesitate to contact your local branch. As always, thank you for choosing FCCU.